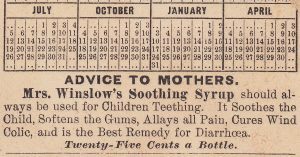 Racist attitudes flourished in the 1880’s, and they were backed by some of the “best” so-called science of the day. 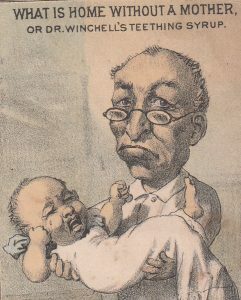 Fueled by Darwin’s theories and naive “new insights” from studies in fields like anthropology and phrenology, some of the most educated Victorian-era elites were among the period’s biggest bigots, and “scientific racism” flourished. Of course, one didn’t have to be a 19th Century intellectual to be a racist. The “sport” of racism was open to all. 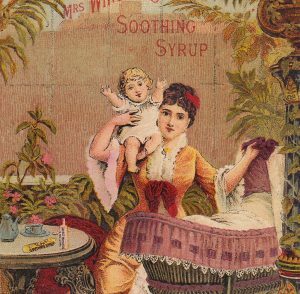 Negative stereotypes of numerous people groups appear in hundreds of Victorian Advertising Trade Card images. 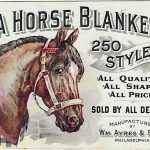 In future articles and blogs, we’ll explore more examples of racial profiling in advertising, and the way many ad cards depict Japanese people, as well as Native American Indians, and immigrants of French, Jewish, Arab, and Spanish heritage. Most metamorphic cards have one flap the folds either up or down (or left to right) in order to change the scene and tell an often humorous story of transformation — typically from a state of misery to a place of joy after finding the correct product to improve the character’s situation. 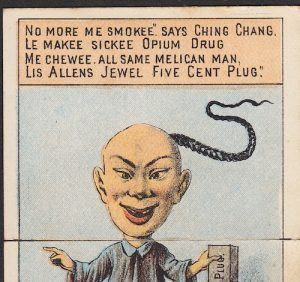 For “Ching Chang,” the laborer from China, Allen’s tobacco offers an upgrade from opium, as well as an opportunity for the man to become “all same melican man” — the same as an American man. For the former slave from the South, “Dis Nig” is now happy, sir. Why? Because “Dis Chile” thinks the Fourteenth Amendment says he must chew “Master Allen’s” nickle plug tobacco. And he likes it! 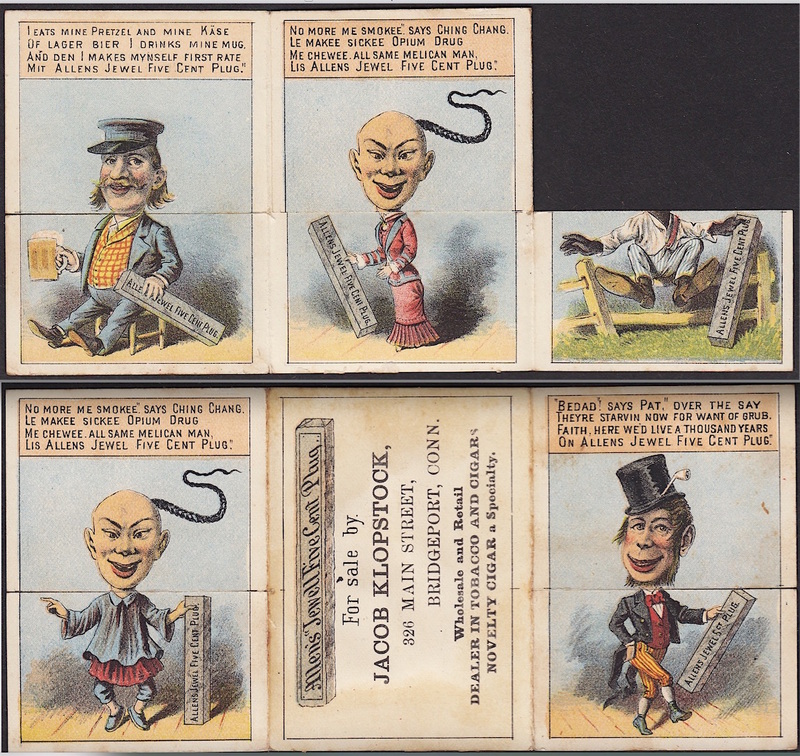 When fully open, this metamorphic tobacco card places a Chinese man on the far end away from the fellow from Ireland, but the card can be folded in a way to bring the two characters together into an absurd mash. Heels up and clay pipe firmly tucked into his hat, the monkey-faced Irishman of this metamorphic tale grins and dances a jig; in his sly simian way, he declares the Irish famine to finally be over… thanks to affordable tobacco. And then, if you manipulate the racist flap images a certain way, you can bring the nonsense of the Irish dancer and the aspirations of the Chinese laborer into a composite new monstrosity. Their merger becomes a bigot’s dream come true… a “comical” figure not to be taken seriously at all. 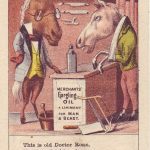 Victorian cards often depict Irish men with “monkey features,” suggesting that — on Darwin’s scale — the tribes of the Emerald Isle are closer to apes than their English cousins from London. 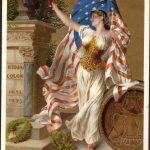 In the pseudo-scientific literature of the 1800’s, the “ape-like” Celt took a beating. For example, Charles Kingsley wrote that he was “haunted by the human chimpanzees” he saw in Ireland, and that “to see white chimpanzees is dreadful; if they were black, one would not feel it so much. . . .” (see: L.P. Curtis, Anglo-Saxons and Celts: A Study of Anti-Irish Prejudice in Victorian England, 1968, 84). 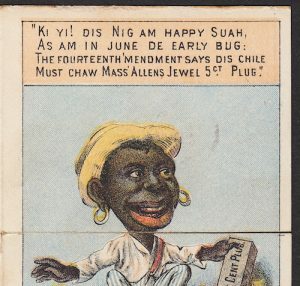 The mean-spirited edge found in most of the cards that are guilty of racial profiling in advertising is usually directed at African-American Blacks and impoverished Chinese and Irish laborers. 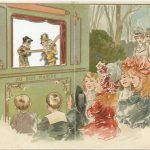 The stereotypes are greatly softened in nearly all representations of German-Dutch immigrants. The worst that can be said of these Beer-Drinking and Pretzel-Munching jolly good fellows is that by-and-large, they’re overweight. Then again, in the 1800’s, a man’s thick waist was viewed as a proof of intelligence and industry, and both were admired traits guaranteed to produce the rewards prosperity… with endless good eating. a plug of Allen’s Jewel Five Cent Chew. With the flip of a flap, the angelic Angeline becomes a plaything… transformed at the will of the tobacco smoking male consumer’s whim into an absurd composite of both “his” and “hers” attributes. In this combination, note how the lady’s auburn-blonde hair and fine feathered hat have been swapped out for a snake-like Chinese queue. 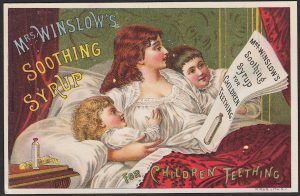 Because many trade cards were issued to advertised products marketed specifically to the female shoppers of the average Middle-class household, women were often honored — if not exalted — in 19th Century ads. Their beauty and poise, and their wisdom and grace, were often above reproach, if not approach. In the case of this particular a male-centric advertisement, however, the woman is neither untouchable nor beyond manipulation. 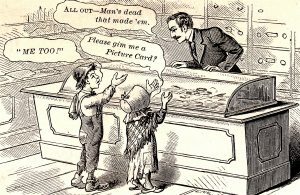 With a quick folding or two of the flaps, the lovely and entitled Victorian Angeline succumbs to the imposition of a Chinese commoner, who is all too eager to weasel his way into the American man’s world! In sum, this one card carries an amazing load of bias. 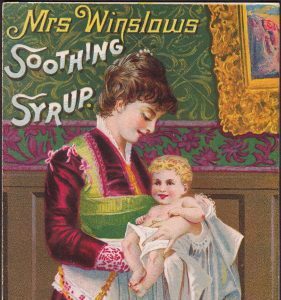 As uncomfortable as an exploration of these ugly themes may feel to most of us today, a card like this is an historically important artifact. It opens a window and sheds light on dark days, times when even the images and language of advertising drifted into hateful places that were largely accepted by the dominant culture of the day. 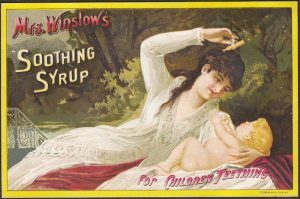 Check back for future blogs on Racial Profiling in Advertising, as well as many other fascinating Victorian Card topics and visual themes!